(Aug 28): Money is flowing out of China at a quickening pace, leading to Beijing selling currency reserves in what amounts to a global quantitative tightening. Absent loosening elsewhere, conditions for riskier assets, and for global growth, will get tougher. The People's Bank of China piled up nearly $4 trillion of foreign assets in the decade from 2003 as dollars flowed in from trade and were invested in securities such as US Treasuries in order to keep the yuan from strengthening. Now the money is going the other way, a trend which accelerated after China experimented with a devaluation and a new semi-flotation of its yuan. 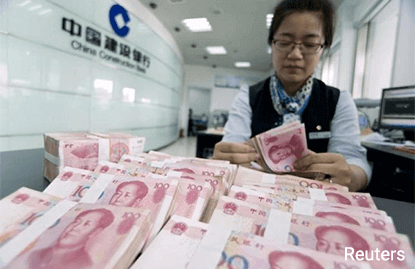 Whereas China had been spending down its reserves at a more than $500 billion annual clip in July, conflicting reports suggest the PBoC may have spent between $100 billion and 200 billion since the Aug 11 currency regime shift. "The PBoC has been defending the renminbi, selling FX reserves and reducing its ownership of global fixed income assets. The PBoC's actions are equivalent to an unwind of QE, or in other words Quantitative Tightening," Deutsche Bank strategist George Saravelos wrote in a note to clients. Remember that the assets bought up and stashed away by the PBOC were larger than all of the Federal Reserve's QE efforts combined. Reserve accumulation by China contributed to the overly loose global financial conditions that built and exploded in the financial crisis. The return journey may prove less of a bang and more of a slow bleed. Already we may be seeing the impact of Chinese selling in the Treasury market. Weak demand at Treasury auctions Tuesday and Wednesday were marked by weak demand from 'indirect bidders', a category into which foreign central banks fall. As well, Treasury prices haven't moved as they usually would during signs of financial stress. Despite their safe asset status, 10-year Treasury yields, now around 2.17%, are actually up by four basis points, with prices moving down, since China's currency shift Aug 11. Bond market guru Bill Gross, of Janus Capital, questioned on Twitter whether China was selling long bonds, an issue he has yet to enlarge upon. Money is flowing out of China for a complex set of reasons. Outbound money is partly direct and indirect investment flows, and partly money controlled by private Chinese citizens seeking a safe haven, both from more difficult financial conditions at home and also from the threat of seizure via official action. China's support of its stock market and its gyrations in currency markets both count as spectacular mistakes. The initial devaluation of the yuan sparked concern that more was to come, leading to greater speculative outflows. At the same time, the heavy-handed but ineffectual support of the stock market managed to inspire fear, with arrests of short-sellers and a financial journalist, but not confidence in official control. While there is little doubt that China's $3.6 trillion of foreign reserves gives it much latitude in how it chooses to deal with outbound capital flows, this is not a state of affairs which can continue indefinitely. China's reserve stockpile is well above what the IMF recommends in similar situations, if we define China as having, more or less, a fixed currency with no capital controls. "In a nutshell, the PBoC's war chest is sizeable, no doubt, but not unlimited. It is not a good idea to keep at this battle of currency stabilization for too long," Wei Yao, economist at Societe Generale, wrote to clients. The concept of quantitative tightening originating from China helps to explain much of the market gyrations of the past couple of weeks. Risk assets have been hit and fixed income faced cross currents. There is likely some demand for Treasuries as a safe haven, and because tightening is bad for growth, but this is countervailed by both the reality of reserve selling and the fear of more to come. There may be no easy way out of this set of circumstances. China's economy will not swiftly reverse course, which might attract flows, nor is it likely to simply allow a sharp devaluation. The reality may well be that after more than a decade of attracting capital flows and stimulating global financial conditions, China, along with the rest of the world, may see a long period of the reverse. Rather than a bubble popping, the correct metaphor may be a long, slow deflation.